is one of those books which, once I started reading, I simply could not put down. The story pulled me in immediately and kept me riveted to the page to the very end. In fact, when the book ended I was disappointed to find myself sitting on my couch in my own world! I am a fantasy fan of long standing and I am particular about what books I read in the genre. In Breath of Angel, Karyn Henley has created a believable and exciting world. Her characters are well drawn and their plight is real and compelling. I can’t wait for the next book in the series! 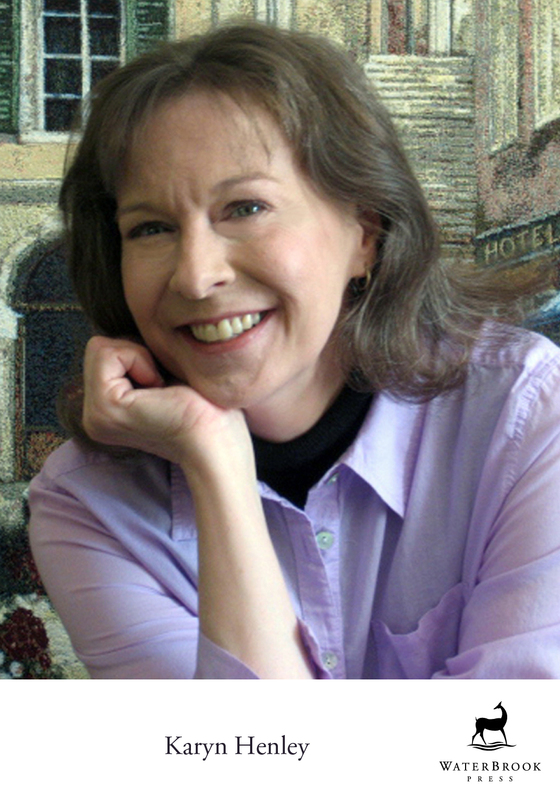 Karyn Henley has written over 100 titles, along with being an accomplished songwriter nominated for a Dove Award. She also received a regional Emmy Award as Music Composer for a television special and lives in Nashville, Tennessee with her husband, a jazz drummer. 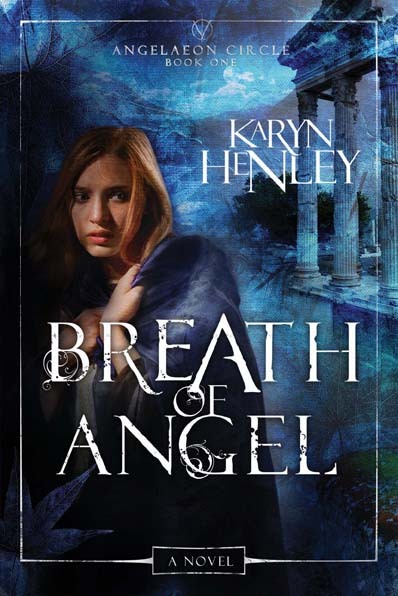 In Breath of Angel (WaterBrook Press, June 21, 2011), award winning author Karyn Henley brings to life the tale of Melaia, a young priestess who witnesses the murder of a stranger in the temple courtyard. A place where age-old legends recited in song suddenly come to life, in this story of two immortal brothers quest for restoration. With Angels. Shape-shifters. Myths and stories… Melaia finds herself in the middle of a blood feud between two immortal brothers who destroyed the stairway to heaven, stranding angels in the earthly realm. Young readers are sure to be intrigued and dig deeper into this make-believe story that explores the payment for redemption. The prick of the thorn drew blood, but Melaia smiled. The last ramble rose of the season was well worth a pierced thumb. She carefully drew the blossom from the vine that clung to the side of the temple. As she breathed its rich, sweet scent, she sensed someone watching and looked up, expecting to see one of the novice priestesses. She saw only dry leaves skittering across the flagstones of the walled courtyard, along with a black feather, no doubt from a bird scavenging seeds in the woodpile. Then a haggard young man stepped through the gate, and Melaia drew back. The chill autumn breeze riffled the edge of his dirt-stained cloak, revealing the corner of a journey pack and the hilt of a dagger. Melaia gave him a tentative nod. “I’ve come—” His voice was dirt dry. He wiped his fist across his mouth. “I’ll fetch water.” Melaia tucked the rose into her waist sash and headed for the stone urn by the arched doorway. “Travelers are always welcome at our temple. We’ve pallets if you wish to stay the night.” She would have to check with the high priestess, but Hanni rarely turned away weary travelers. “My thanks,” the man croaked. The young man looked too weary to tell tales. Or too ill. His dark-ringed eyes darted from one afternoon shadow to another, and he cocked his head as if he heard something beyond the walls. “We’re healers here as well,” she offered. For a moment his wild eyes focused on her. Then he glanced above her head, and his hand went to his dagger. But he never drew it. A hawk, larger than any she’d ever seen, shot like an arrow past Melaia and sank its talons into the stranger’s chest. The man’s raw screams pierced the air as the hawk’s beak knifed at his throat. Melaia stood stunned and speechless. But as the hawk flapped its great wings and lifted the man a handbreadth off the flagstones, her senses surged back. But it was the hawk that fought, its wings beating at her stick as its claws snagged the man again. At last Melaia struck a solid blow to the hawk’s head, and it skidded sideways. She chased after it, but the raptor took to the air, quickly rose, and soared away over the domed roof of the temple. Melaia flung aside the stick and fell to her knees by the bloodied man. Then she covered her mouth and swallowed a bitter taste. “Most High, have mercy,” she croaked. Seeing wounds so deep and blood flowing freely, she wasn’t surprised that the stranger’s mistlike spirit had emerged from his body. As a death-prophet, she could see the shadowy echo writhing around his form as he struggled to live. “Mellie? Is it safe?” Dark-eyed Iona stood in the temple doorway, holding back the other two novices. At fourteen, she was the motherly one, although Melaia was two years older. Curly-haired Peron, still baby plump at six, peered around Iona, clutching her skirts, while twelve-year-old Nuri broke away from them and ran across the yard, her usual dimpled smile gone. “Is he dead?” Nuri asked. As Nuri dashed away, Melaia wondered why the high priestess hadn’t appeared. “Where’s Hanni?” she called to Iona. “Summoned to a birthing. The weaver’s wife.” Iona nervously twisted the end of her black braid. Melaia hesitated. She was often called to the bedside of the dying to confirm the moment of death, but never had she been required to reach through a spirit to touch someone. Of course, other people did it all the time, she told herself. They just couldn’t see the struggling, mistlike layer. She took a deep breath, grasped the man’s bloodied cloak, and pressed it to the gashes in his chest. His spirit pooled around her wrists, vibrating like a throat quivering with speech. “Can you hear me?” Melaia asked, keeping pressure on his wound. The stranger’s spirit thrummed frantically, as if he were trying to say something. “Where’s the plumwort?” Melaia yelled. Nuri ran across the yard, sloshing a jar of water. Peron trotted behind her with the basket of plumwort. Iona knelt at the man’s feet, her mouth moving silently in prayer. Melaia reached for the plumwort, but the man’s spirit slid off his body, thinned into a stream, and seeped through a crack in the flagstones. A sudden, grim silence fell over the yard. Melaia shook her head at Nuri and Peron and closed the man’s green-flecked eyes. “No, I was.” Nuri’s shoulders drooped. “No one’s at fault,” said Melaia, but she couldn’t help thinking that the man might still be alive if she had only laid into the hawk sooner. “Let’s get him inside.” She lifted his upper body. For his bulk he was surprisingly light. could afford no better. Melaia took a deep breath, wishing Hanni were there. “But it’s bloody,” said Nuri. Peron wrinkled her nose. scrambled out the door. Iona followed. Melaia gently eased the man’s cloak from his chest and winced, wondering where Hanni would begin. She exhaled slowly. “Start with the easiest,” she murmured. She untangled his pack from one forearm. As she slipped it free, she noticed the end of a small scroll clenched in his fist. “First the pack,” she told herself, glancing around. Her gaze fell on a shelf of incense bowls. She stashed the pack there, then turned back to the altar-bier and froze. The stranger’s cloak had fallen back and, with it, a long, white, bloodstained wing. Melaia’s knees almost buckled. “An angel?” she whispered. It couldn’t be. Angels were found only in legends. Chanters’ stories. Bedtime tales. Melaia jerked the cloak back around the man. “We need Hanni,” said Melaia. Distant drums signaled the closing of Navia’s city gates and the change of watch on the walls. On the altar-bier in the temple, the winged man lay serene and clean, covered in white linen up to his chin. Melaia didn’t often sit with the dead, but as she lit the oil lamps behind the bier, she decided that tonight she would request a vigil. 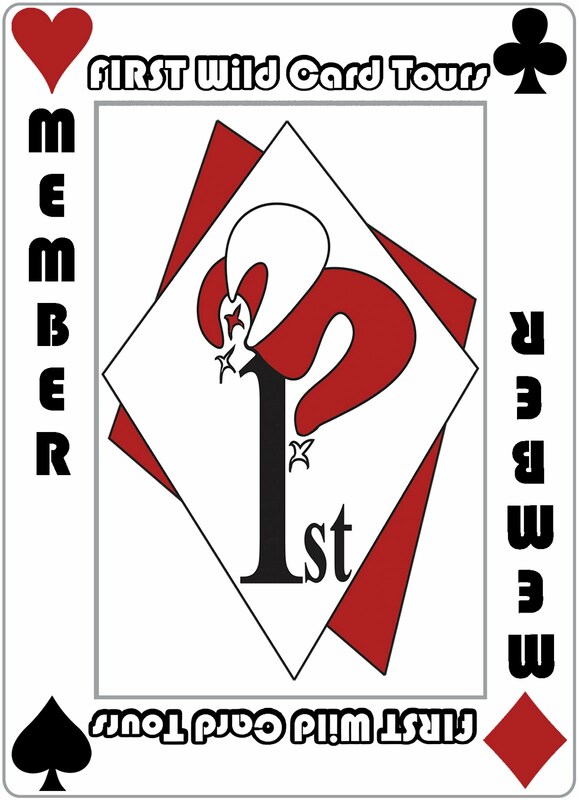 She hoped the high priestess would join her, for she had a night’s worth of questions to ask. that the birthing was a difficult one and she must stay with it, although she was upset at the news of a death in the side yard. Hanni intended to stop by the overlord’s villa and bring his advisor, Benasin, back to the temple with her. As Melaia held the flaming twist of rushweed to the last wick, she eyed the three girls munching their supper on a reed mat across the room. With Hanni gone they had asked to stay with Melaia instead of eating in the hearthroom down the hall. She was glad for their company. She felt as shaky as they did, although she hadn’t told them about the stranger’s wings. She wanted Hanni’s opinion first. Melaia tossed the spent rushweed into the brazier in the center of the room and stirred the coals into flame. For a moment she watched the smoke curl up and drift like a dying spirit out through the roof hole above. Except dying spirits always drifted down, not up. “I’m saving my scraps for the chee-dees,” Peron said, scooping her crumbs into a tiny hill. Peron stared warily at the dark corridor that lay beyond the bier. “I’ll go with you.” Nuri slipped one of the lamps from its niche. With an uneasy smile she guided Peron to the corridor, giving wide berth to the bier. “She must have been inspired by the hawk in the yard today.” Melaia stacked the empty wooden bowls and glanced at the stranger who should have eaten a meal with them tonight. “Peron said the falcons were darker than closed eyes,” said Iona. “I can picture that.” Melaia lifted her harp from its peg. “And they had people hands.” Iona rolled her eyes. A shriek came from the corridor. Peron darted into the room, hugging her crumb jar, with Nuri on her heels. Both girls were open-mouthed and wide-eyed. completely of feathers—brown, black, and an iridescent blue that glinted in the lamplight. The skin around one of his round gold eyes was blackened, and a scratch jagged across his brow. Melaia went cold, head to toe. How had the man entered? Had she left the side door unbolted? Nuri and Peron ran to Iona, and all three huddled by the wall. Melaia stifled her impulse to join them. Hanni had left her in charge, so in charge she would be. She had fought off a murdering hawk. She had prepared a bloody winged man for burial. She would stand up to this intruder. She strode to the brazier, her hands clammy as she clung to her harp. “This is the temple of the Most High,” she said, hoping he wouldn’t hear the quaver in her voice. “She’s the chantress,” blurted Peron. “Ah. Singer of songs, soother of sorrows,” he crooned. “If you’re here for our treasury box, take it and be on your way,” said Melaia. “I have unfinished business with the high priestess,” he said. “You can find her at the overlord’s villa,” said Melaia. Peron’s eyes grew round as the supper bowls, and she shrank behind Iona’s skirts. Melaia hugged the harp tighter to her chest and glared at the man defiantly, even as she fought back a fear that curdled in the pit of her stomach. How long had this swaggerer been spying on them? Melaia swallowed dryly. She felt her courage fall as limp as the poor stranger in the yard. Keeping her eyes on the intruder, she sank to a bench by the brazier and positioned the harp in her lap. the melody, they silently gathered around, and she breathed easier. Together they were safer, with the brazier as a barrier between them and the bully. She turned her attention back to the harp, and over the music she spoke the tale. a wealthy trader, his second-born a lone hunter. Each year at harvest festival, his sons vied to present him with the best gift. The Firstborn always gave perfumes, musicians, slave dancers, the treasures of his trade. The Second-born presented partridges, deerskins, lion-claw necklaces, the spoils of the hunt. But the Second-born thought his gifts paltry compared to those of the Firstborn. So he set out to seek the greatest gift of all. Far and wide he journeyed, to no avail. At last, weary and discouraged, he lay to rest in the shade of a tree as tall and wide as the tower of a citadel. The Wisdom Tree it was, bearing fruit that granted the eater knowledge and cleverness. An angel named Dreia, guardian of the Tree, saw the Second son lying there and asked the cause of his despair. When he told his tale, she pitied him and gave him the juice of one fruit. “This will grant you knowledge and cleverness to find the right gift for your father,” she said. Dreia hadn’t intended to give the man a whole fruit. Its seeds were precious, carried by angels into the heavens to plant wisdom trees in worlds among the stars. Yet the man was handsome, his entreaties eloquent. The Second-born agreed to the bargain, for the one who always greeted his homecoming was his old hunting dog. Taking his dog and the seeds back to Dreia would be good reason to see the beautiful angel again. So he carried the fruit home. The Second-born fell to his knees and wept, not for his dog, but for his niece, the only daughter of the Firstborn, now to be payment for his debt. Melaia paused as the intruder slipped off his gloves. His fingernails were long, curved, and sharp. Talons. Her pulse pounded at her throat. His blackened eye, his scratched brow, his feathered cloak, his limp. She had met him before. As a hawk. Melaia felt foggy, as if she were in a dream. She tried to gather her thoughts. “The Second-born knew only one way to escape his debt,” Iona prompted. “Yes.” Melaia cleared her throat and forced out the words. The Second-born knew he had to destroy the Wisdom Tree. Dreia saw an army approaching, the Second son in the lead, betrayal in his heart. She gathered what angels she could. Some plucked the remaining fruit and hastened over the stairway to celestial worlds. Others stayed behind to defend the Tree. But these were not warring angels. The best they could do was save some of the wood as the Tree fell and was plundered by men who wanted pieces for themselves. “That was the end of the stairway,” Nuri said. “And the end of angels in our world,” added Iona. He snatched up the corpse, and its wings unfolded. The girls shrieked and ran to Melaia. The hawkman dropped the body back to the bier as if it had burned him. “Maybe he lost it in the side yard.” Melaia felt her face grow warm at the half lie. But the man didn’t press his search. Instead, he stiffened and stared at the front door, his head cocked, listening. Melaia heard only wind, but the hawkman slowly retreated, tense as a cat backing away from danger. He glanced from the door to the window to the roof hole, where smoke drifted into the night. Then he hurtled toward the brazier, and his body contorted. All of Melaia’s instincts screamed at her to run, but she stayed her feet, clenched her jaw, and gripped the poker with both hands. As the hawk leaped into the flames, she swung with all her might. She struck only air as he rose in the smoke and vanished. Interesting. Fantasy isn’t my favorite genre, but that first chapter sounds good. Sounds interesting! I’ve read some great Christian Fantasy. It’s a good blend!